Home Tags Posts tagged with "meatballs"
There are few places where duck is as ubiquitous a culinary staple as in Central Europe, in particular Germany, Hungary, Czech Republic, and Slovakia (the other places would be France, China, and Southeast Asia). Roast duck, served with potatoes and red cabbage, seems to be on the menu of every other restaurant, prepared this or that way, especially in winter. If the potatoes aren’t puréed, then the cabbage is. Or the cabbage is cooked in sweet red wine, and served with potato croquettes, or potato dumplings. Sometimes there’s a prune here and an onion there. Sometimes it’s just the breast instead of a whole or half bird, and sometimes the duck is really a goose, as in the following photo — and in which case it’s often too tough, so you should take my advice and not order it. However, the inspiration behind this recipe is actually twofold. All aside from the prevalence of duck in Central Europe, I returned home from last fall’s hunting trip with no deer but a decent number of ducks (no, I wasn’t hunting ducks from a tree stand with a big game rifle; these were two separate outings during the same trip upstate). I’ll talk about my adventures with Huntsman / Captain / Musician / Innkeeper Bill in a separate post soon, but obviously these ducks needed to be eaten. The duck is wild, and, at least in the US, this means you wouldn’t just roast the whole bird. Not just because the leg meat would be incredibly tough, but also because you shouldn’t eat the skin due to environmental toxins. So you end up mostly with skinless breasts. But these breasts are phenomenal. In fact, I would say they’re the best meat of all the things I’ve hunted, period. I love farmed duck too; it’s an excellent meat and could be used for this recipe with great results. But wild duck boasts the perfect gamey taste, powerful yet not to the point where I would call it an acquired taste. (Or is it that I acquired the taste long ago and don’t even remember?) At the same time, when cooked properly, they’re still very tender, which is much more than I would say about goose. There’s still some meat to be picked off the carcasses and the legs, though. Many hunters simply collect the breasts off their ducks. It’s considerably faster, it represents something like 75% of all the meat, and that’s the best part anyway. But since I don’t have to process thousands of ducks a year like the hunting guides do, I take the time to skin the whole carcasses, clean them, and vacuum-seal them using the little portable sous-vide machine that I brought along to Bill’s presidential hotel suites. This extra meat is great if you grind it, hence the meatballs I’m making today. I do realize that my recipe call for more leg meat than most ducks yield, so you’ll have to be creative: throw a duck breast in the mix, add some store-bought duck meat, or add some ground chicken. The meatball recipe is loosely inspired by J. Kenji López-Alt’s The Food Lab: Better Home Cooking Through Science, and the results are pillowy and delicious. The cabbage purée is meant to go with the duck. On its own, it may not be the best you’ve had, but it’s perfect with the duck. It’s well-balanced, just slightly sweet and slightly sour. Too often, red cabbage preparations are too sweet — this is not a dessert! 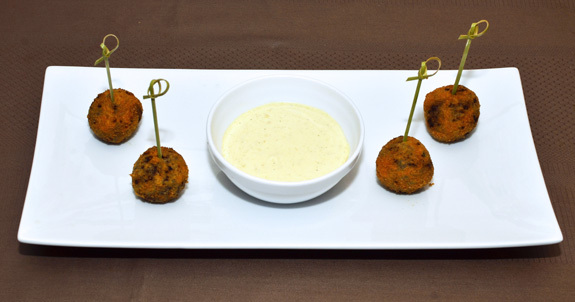 Next, the potato croquettes. The name has come to evoke something purchased in the frozen food aisle of the supermarket, something with a suspiciously crispy shell containing a dense glob of insipid mashed potatoes. That’s not what I had in mind! I wanted something airy that tasted like potatoes. Two slightly conflicting requirements, because in order to remain airy the croquettes need gluten, which isn’t found in potatoes. I could probably have learned something from gluten-free baking recipes, where xanthan gum is added for binding. Or I could have just bought gluten. But for this time, I stuck to basic ingredients and simply tweaked the proportions over many iterations until I got the right results. Sooner or later, I’ll go back to this recipe and try something else. Finally, my recipe contains both onions (caramelized) and prunes (in the meatballs), so I can proudly claim to have gathered as many traditional ingredients and clichéed pairings as possible in a single dish! In a saucepan over low heat, melt the butter in the water. Add the onions with their skin on, and cover with a lid. Cook on the lowest possible heat for 45 minutes, flipping the onions halfway through. Let cool for 5 minutes. Peel the onions, transfer to a bowl, then pour some of the cooking liquid on top, season with salt, and reserve. Alternate method, for sous-vide enthusiasts: skip of all the steps above. Instead, vacuum-seal the peeled onions with the butter and salt but without the water, and cook them in a 90 C / 200 F water bath for about 6 hours. Combine the yeast and milk, and let rest for 5 minutes. Cook the potatoes in unsalted boiling water until tender. Drain, and let cool for 5 minutes (this is important, as it also dries out the potatoes a bit). Rice the potatoes into the bowl of an electric mixer fit with the paddle attachment. Mixing on medium speed, add the butter, followed by the flour, salt, pepper, and nutmeg. Wait until the potatoes aren’t too hot (no more than 37 C / 100 F), then add the yeast mixture. Cover, and let rise 1 1/2 to 2 hours, until doubled in volume. Heat the canola oil to 180 C / 360 F in a pot, for deep-frying. Before serving, roll the dough into 3 cm diameter balls with wet hands. Gently drop the balls into the oil, and cook until golden brown, flipping them several times. Drain on paper towels, and keep in a warm place. In a saucepan over medium heat, sauté the shallots in half of the butter until translucent. Add the red cabbage, season with salt and pepper, and sauté for a couple minutes. Stir in the cumin and nutmeg, then add the wine and vinegar. Simmer for a couple more minutes, cover, and cook over low heat for 15 minutes or so, until tender. Transfer the mixture to a blender, add the sugar and the rest of the butter, and process until smooth. Pass through a chinois, and reserve. Sprinkle the gelatin over 40 g of the heavy cream, and let rest for 10 minutes. Add the bread to the heavy cream mixture, and allow to soak for 10 minutes, mixing occasionally. Grind the duck meat in a meat grinder using the large die. In a bowl, combine the meat, bread mixture, egg, cheese, cumin, pepper, and salt. Grind in a meat grinder all together, again using the large die. Divide the mixture into portions of 45 g each. Proceeding one at a time, flatten into a disc, place a prune in the middle, and fold into a ball. Fill a pot with 3-4 cm of canola oil, and heat to 175 C / 350 F.
Deep-fry the meatballs for 2-3 minutes, until brown on all sides, then drain on paper towels. Transfer to a sous-vide pouch with the remaining 100 g of heavy cream, and vacuum-seal. Cook in a 57 C / 135 F water bath for 1 ½ hours, then reserve. Season the duck breasts with salt and pepper. Place in a sous-vide pouch with the butter, and vacuum-seal. Cook in 50 C / 125 F water bath for 30 minutes, and proceed to assembly. This is the time to deep-fry your potato dumplings (see above). If you’ve already done so, you can fry them a second time for a few seconds just to reheat them. Take the duck breasts out of their sous-vide pouch. Lightly season with salt (they’ve already been salted once). Sauté in canola oil in a very hot pan just long enough to brown on both sides. Reserve. Reheat the caramelized onions and the red cabbage purée (don’t tell anybody, but a few seconds in the microwave works just great). Take the duck meatballs out of their sous-vide pouch. On each plate, spread a disc of red cabbage purée in the center. Top with pieces of duck breast drizzled with some of the butter from the sous-vide pouch. Surround, in an alternating pattern, with two caramelized onions, two dumplings, and two meatballs drizzled with some of the cream from the sous-vide pouch. Serve! I’m finally starting to act upon my New Year’s resolution of blogging more national dish recipes! Earlier this month it was Liberland, now it’s Albania’s turn. And you even get two dishes for the price of one: tavë kosi and qofte të fërguara. Tavë kosi is a baked dish of lamb and rice covered with yogurt (in Albanian, tavë means casserole, and kos, yogurt). It’s not always terribly exciting, based on the few times I tried it in Albania. Sometimes the casserole seems to be made of nothing other than those three core ingredients. 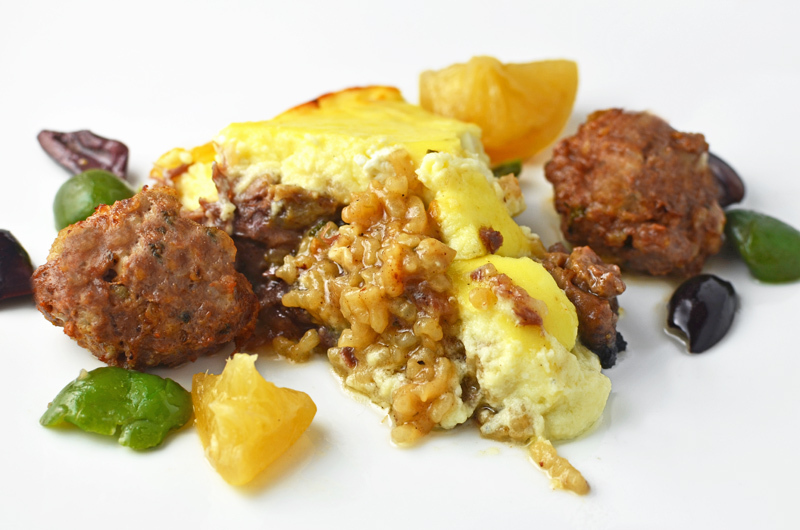 The lamb can be dry and the yogurt mixture can have the texture of an overcooked frittata. In my recipe, cooking the lamb shanks with the rice in a pressure cooker ensures one gets both moist and tender meat, and flavorful rice. Adding feta to the yogurt and going easy on the eggs makes the mixture very soft — borderline liquid — and therefore less dry. And I’m adding garlic, herbs, and spices, too. Still, I feel like tavë kosi needs an accompaniment. So in pure Food Perestroika style, I’m serving my meat with more meat, the qofte të fërguara. Don’t be scared, it just means fried (fërguara) meatballs (qofte). Between the lamb, yogurt, lemon, olives and oregano, we have a harmonious and more interesting flavor profile. And if you want less meat, well, you could start your meal with a vegetable salad. Albanian qofte can take various shapes — round balls, patties, ovoids. I’m opting for balls here, just slightly flattened. More importantly, given that most countries in the world each have their own form of meatball, I wanted my qofte to be somewhat distinctive. Onion, oregano, and breadcrumbs are common ingredients in Albanian recipes, and I added lemon and olives, a southern influence from neighboring Greece. I’m using preserved lemon, which can be purchased here. This is more of a North African thing, and purists can replace it with fresh lemon and salt, but it has the merit of making the entire lemon edible (and it’s just a pickled lemon; pickling is used in any cuisine). Finally, I usually like my meatballs stewed rather than fried — it makes them considerably softer. However, by cooking them sous-vide before frying, I get a very tender result that can still be called qofte të fërguara (a good thing, since I have no idea how to say “sous-vide” in Albanian). You’ll notice that the meatballs don’t look the same in all of my pictures. That’s because I tweaked the recipe after making the tavë kosi. What you see in the picture directly below this sentence is what you should be aiming for. Season the lamb shanks with salt and pepper. In a pressure cooker over high heat, sauté in olive oil until brown on all sides, then reserve. In the same pot, sauté the onions and garlic for a minute, stirring constantly. Mix in the star anise, and cook for another minute. Add the rice and the wine, and simmer for a couple minutes. Return the lamb to the pot, and add the water. Close the pressure cooker, bring to pressure, and cook for 1 hour. Let rest until the pressure goes down. Take the lamb shanks out of the cooker, and pick the meat from the bones, trying to keep it in large chunks. In a bowl, gently mix the meat, rice, cooking liquid, and the oregano. Cover and reserve. Melt the butter in a saucepan over medium heat. Add the flour, and stir for 2 minutes to make a roux. Remove from heat, and mix in the feta. In a bowl, combine the eggs and yogurt, then season with salt and pepper. Mix in the roux in a few additions, to avoid cooking the eggs. Reserve. Place the pressure-cooked lamb shank mixture at the bottom of a 23 cm diameter pie dish. 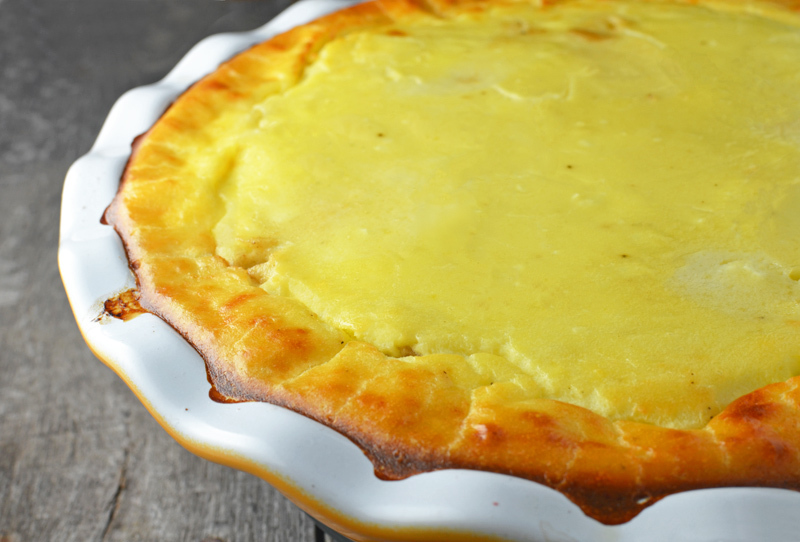 Top with the yogurt mixture — you may have a little bit left over; don’t overfill the dish. Bake in a 175 C / 350 F oven for 40-45 minutes, until the yogurt barely jiggles when you shake the dish. Let rest a few minutes before serving. In a saucepan over medium heat, sauté the onion in the olive oil until soft. Let cool. In a bowl, mix the onion, ground lamb, breadcrumbs, salt, piment d’espelette, and oregano. Pass the mixture through the small die of a meat grinder. Make 16 meatballs of about 40 g each, round but slightly flat. Cut olives into halves, and cut the lemon into 8 pieces. 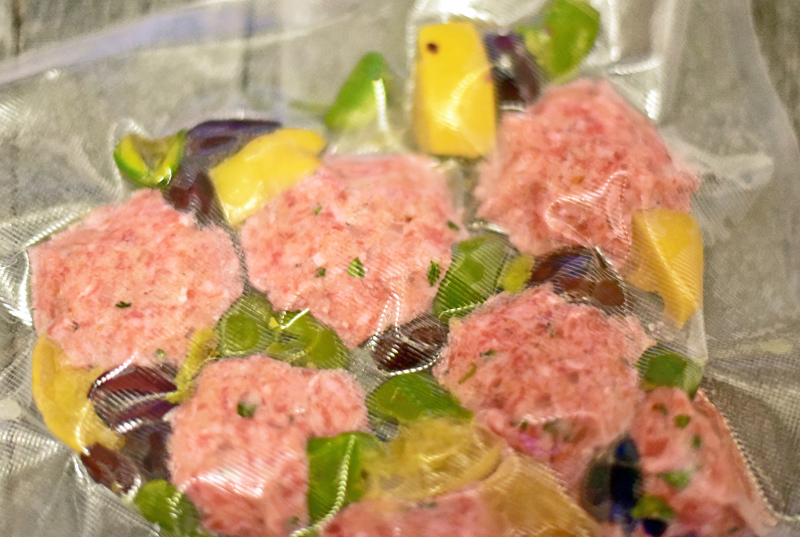 Place the meatballs, olives, and lemons into one or more sous-vide pouches, and vacuum-seal. Cook in a 57 C / 135 F water bath for two hours. 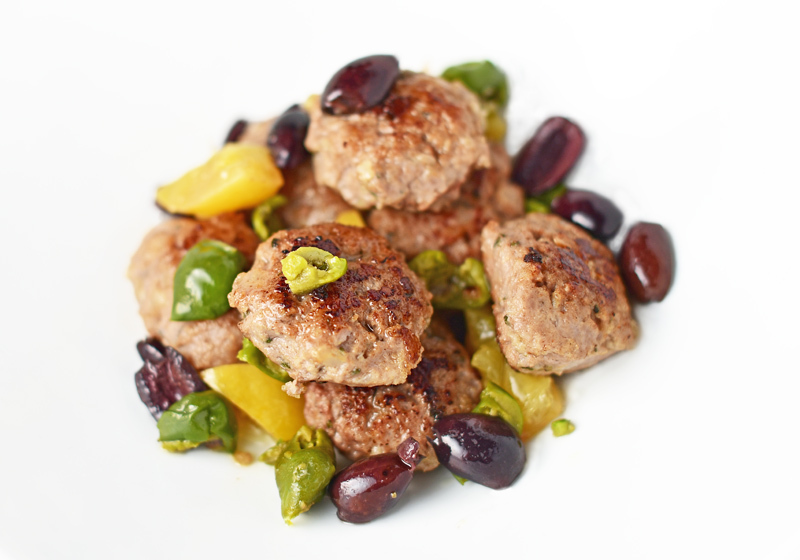 Take the meatballs out of the sous-vide pouches, as well as reserving the olives and lemon. In a frying pan oven high heat, sauté the meatballs in the canola oil until brown on both sides. Reserve. Cut the tavë kosi into 8 slices. On each plate, place a slice of tavë kosi, and flank with two qofte. Garnish with the olives and preserved lemon. Spring turkey hunting season lasts the whole month of May in New York State, and a couple of weeks ago, I went upstate to try for a few birds with Hunstman Wayne. 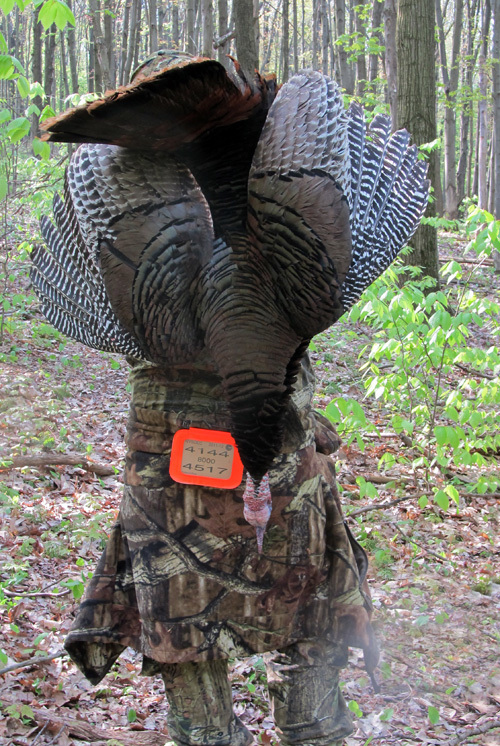 I’d already gone on a turkey hunt with Wayne in 2011, but I had missed my chance, mostly because of my lack of experience. This year, I was back with a vengeance, and, hopefully, better confidence in my shooting skills — all those hours at the Westside Rifle & Pistol Range have to bear fruit at some point, right? With my first deer now in the freezer, I need to come up with recipes for the whole beast. I made a great roast out of the hind leg last weekend (more on this another time), but I had cut off the less tender shank and saved it for another recipe — hence these luscious and distinctive meatballs. 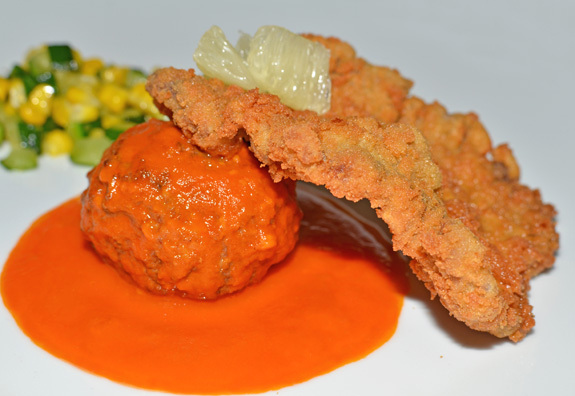 Instead of being ground, the meat is first stewed, then wrapped around a cube of foie gras, and then breaded. 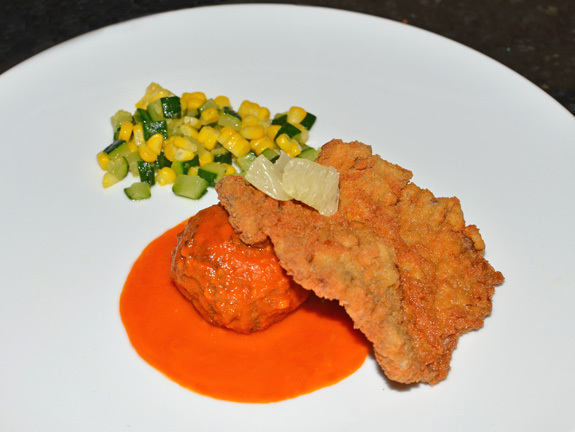 Thinking about it, this recipe combines three Hungarian traditions: hunting, foie gras, and deep-frying. My friends have been facetiously calling them “Hunter’s Balls”! I served them with a slightly sweet dip made of crème fraîche mixed with onion jam. Season the deer shanks generously with salt and pepper, then sauté in an oven-proof pot with olive oil over high heat, until brown on all sides. Add the carrot, onion, parsnip, celery, and garlic, and cook for a couple of minutes, stirring constantly. Add the red wine, bring to a boil, simmer for 2-3 minutes, then add the water and the thyme. Bring back to a boil, cover with a lid ajar, and cook in a 200 F oven for about 4 hours, until very tender. Let cool for 30 minutes. Take out the shanks and reserve. Strain the cooking liquid, and reduce to 8 oz in a saucepan over high heat. Shred the meat between your fingers, then finely chop with a knife. Add the meat and the cacao powder to the saucepan, and cook over medium heat until almost completely reduced, stirring regularly. Mix in the butter, and continue cooking until there is no more liquid, but without drying out the meat. Let cool and refrigerate. Place the bread slices on a baking sheet on the oven rack, and toast at 300 F for 10 minutes on each side. Break the slices into pieces, and pulverize in a blender. Reserve in a closed plastic container. Cut the foie gras into approximately 20 cubes. Take a small amount of the deer shank mixture and flatten it. Place a cube of foie gras in the center, wrap it in the meat, and shape into a ball between the palms of your hands. You should use just enough meat to completely cover the foie gras. Repeat until you run out of meat or foie gras. Refrigerate for at least 30 minutes. Place the flour, beaten eggs, and breadcrumbs into 3 separate bowls. 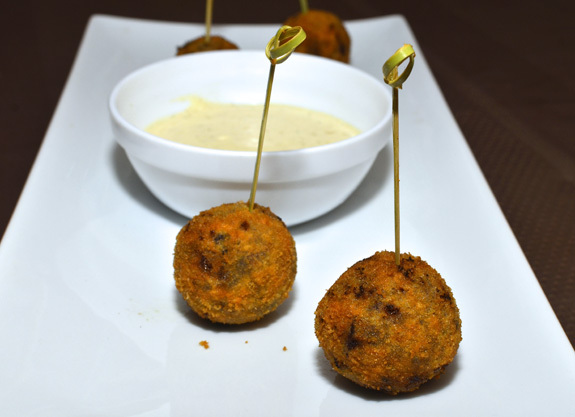 Heat the deep-fryer to 360 F. Coat each meatball with flour, then dip into the egg, and thouroughly cover with breadcrumbs. Deep-fry the meatballs in small batches for 3-4 minutes, until golden brown on all sides. Let rest on paper towels for a minute, then serve.